Readers of a gentle disposition in no mood for a rant—much less an anorak rant—are advised to point their browsers elsewhere. Yesterday I spent the day trying to pull together a coherent picture of public transport in the North Berwick area with the idea of publishing a short, lucid timetable for use by our many tourists. I failed. Miserably. The logical among you will ask “how hard can it be?” Indeed, in such a rural idyll with one train and four buses in the entire North Neuk of East Lothian, it should be a doddle. But there’s a history. Roll back to the eighties when the government of the time believed in market competition in all things and deregulated buses. There did indeed follow a free-for-all in most cities that left a couple of companies glaring at each other and trying to get by on minimal £1 fares they dare not raise. But out here in the rolling mangelwurzel fields of Bucolitopia, commercial routes became an endangered species, the rest sustained only by council money paid to bus companies to run evening/Sunday/any services. The ploughman’s wife on Norglaur Farm needed to get her shopping in town, so these minimal rural runs were supported for social reasons. Trouble is, Norglaur and its ilk is now tenanted out and its steading become £450,000 homes whose Chelsea Tractors see far more use than the slow and infrequent rural bus. For the last 20 years, rural passengers have suffered badly from deregulation. Commercial routes charge exhorbitant fares because there is no competition and supported routes (if two buses a day can be called a route) run so infrequently people avoid using them. Best of all, rapacious operators like First would undercut local bids for routes and then balloon their price for the next bid because they knew the smaller operator could not risk bidding and failing. Supported bus costs rocketed while service was cut back. Seven years ago, I campaigned for a summer free shuttle bus—nothing major, but an hourly service that met the train, whipped round the main local attractions, then back to the station. Given that parking in NB is a summer nightmare, especially on weekends, it is a sensible way of squeezing more visitors in. The Seabird Centre arranged a joint ticket with First ScotRail but First Bus refused to honour it on the shuttle so a Swedish family would struggle to find 80p each in ‘foreign’ money to ride the mile to the SSC. First also used a clunky full-size bus without special decoration when a 15-seater plastered with Summer Shuttle logos could have advertised its own services. The annoying points weren’t just that companies took a blinkered view, it was that the council were unable to see this as more than a school bus contract. They put neither posters nor timetables at the stops, printed no leaflets, did nothing to link with the train and, probably worst of all, never allocated the contract until it was too late to advertise it in all the literature being printed for that tourist season. This went on for five years. For two of those years, it actually did work. The difference was a semi-retired bundle of energy from Wallyford called Tom Armstrong who saw the potential. He had racks made for the bus, put posters in its windows, boned up on local geography and history and was off along the platform meeting each train to invite arriving tourists to use his services. It was a revelation while Tom was there but his retirement put an end to all that. He was replaced by another glum driver from Musselburgh whose response to any tourist question was an incomprehensible grunt. This year saw the great First Bus Scramble when First suddenly announced they were pulling out of half the routes they ran in East Lothian. Locally they kept the X24 service to Edinburgh and—annoyingly (because anyone could do it better than them)—the 111 Summer Shuttle. The 121 Haddington went to Prentice and Eve’s kept the 120 Dunbar service. This leaves a real pig’s breakfast: none of the four routes are co-ordinated either with each other, nor with the train, except for shuttle and train. No ticket issued on one bus is valid on another and the concept of a single travel ticket valid on all—bog standard on the Continent for the last half-century—is still a mystery here. Visitors must go away thinking Scotland is a nice but difficult to visit because its public transport is appalling. So, yesterday was the day I tried to boil this mess down into something palatable. I tried to think like a tourist as to what could make a visit as easy as possible and came up with the formulation below. Whether anyone who gets to the Museum of Flight could also visit Tantallon Castle in one day, let alone see all four attractions, is questionable. 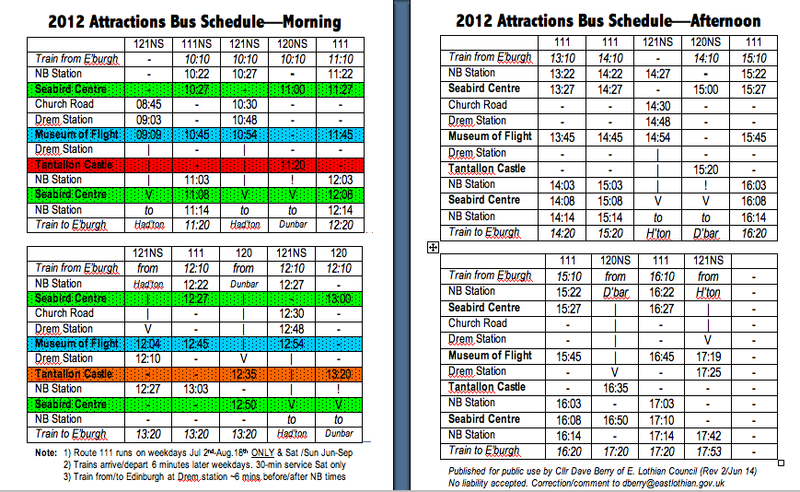 This timetable is still deeply flawed and I welcome suggestions for improvement. But perhaps you can’t get there from here as long as each bus and train operates as if it were on its own isolated planet and information totally ignores any passenger who may never have been there in their puff before. It may be yet another argument why Chelsea Tractors and petrol still make sense at £1.35 per litre. This entry was posted in Commerce, Transport and tagged public transport; bus; train; tourist. Bookmark the permalink. From up here in Stornoway, it seems like you’re living in the 20th century. Fair comment—but it’s always been less fair in the Isles. Not to make you feel worse but it’s down to £1.29 here this week.